When I heard that a recording was taking place at Giovanni Hidalgo's home studio on October 23rd, I immediately booked a flight for this historic occasion – and I was not disappointed! 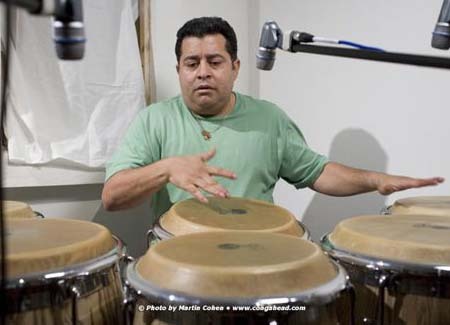 Gio gathered some of the best musicians for this unique event to memorialize the legendary musician Tito Puente – including Eddie Gua Gua Rivera, Tito Degracia, Millo Torres, Doug Beavers, Anthony Carillo, Eric Figueroa, El Grecco, Tony Martinez, and Rigo Collazo. I would like to acknowledge the incredible help of Giovanni's engineer, Jhean Paul Bracho, and my assistant, Jefferson Gonzalez. To see a video of the musical performance from this event, please click here.